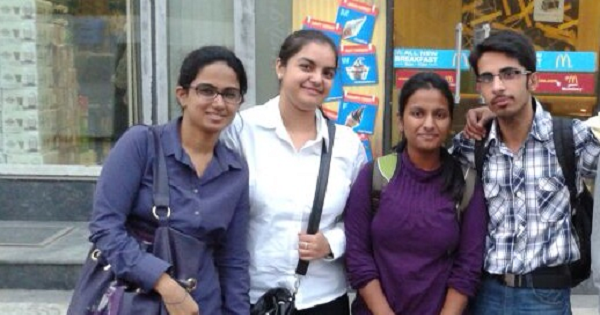 Gurpadam Kaur (extreme left) interned with the job portal giant–Naukri.com. Gurpadam is an MBA student at Delhi Institute of Advanced Studies. Read on to explore more about her internship experience. After the 2nd semester’s exams finished, my next main project to do was ‘internship’. Although it seemed too easy for many, I was a bit nervous as I did not get the internship when almost 90% of my class very well knew their destination. On the day of my Human Resource exam there came an email stating that naukri.com is looking for interns planning to pursue Human Resource in the future. Excited, I sent my resume to the HR of naukri.com. I received the reply within 2 days which was about to change my Internship woes into bliss. 7 students were selected and being one of them felt good. Then came the big day of my life. The day when I had to go to the office of naukri.com which was destined to become ‘my workplace’ for the 8 weeks. I still remember without fail the moment I stepped into the office, that aura mesmerised me completely. After waiting for the next 20 minutes we were made to have a look at the office and sat in the cabin where our Group Discussion round was to be conducted. I still love calling it my battle ground. All seven of us, dressed in white and black formals and equally nervous, walked like a train one after another. The first round was the group discussion round. The topic was- Social Media. Having argued over the topic for 5 minutes, two judges went out of the cabin to discuss. When one of the judges came in the room all she said was that 3 of us were selected to go to the final interview. That feeling of getting through was awesome and still cannot be described in words. Exams over and the process of internship began. Ours was the longest internship of exact 8 weeks (starting from 12 June and ending on 6 August). The documents had to be submitted to the main office of Infoedge. The main office was like a dream come true. Completely corporate, everything there was just perfect to be explained. But just like a dream, it didn’t last long and the adjustment had to be made with the smaller office. The day we entered the naukri office, my thoughts about internship came all over again wherein people used to say that interns are made to sit on one corner and they actually do nothing and complete the left over works of others. But that myth didn’t last long. First two days were the days of complete training wherein the products of naukri were told and throughly explained to us. Third day made us completely professional with all three of us having individual computers and seats to work upon. That happiness and the sense of belongingness is still nostalgic. Then landed the first week project task. Challenge- to hire new people in naukri through cold calling etc and to make sure that they would meet the eligibility criteria of naukri. By the end of first week another surprise was waiting for me. My main project- the competitive market research project was assigned to me. The project mainly focussed on employee sourcing patterns in various organisations. But the major task was yet to come–talking to the recruiters. Being just a college student I was completely naive as to how would I talk to the clients of naukri who are ultimately the recruiters of big firms. The excitement and nervousness was in equal proportion in my body. Excitement, to get such a big task, and nervousness, as the responsibility was equally huge. But being mentored constantly was a big support. The first call was made on 25th June. I stammered a bit but my happiness was the ultimate factor for motivation. The challenge was to ask 26 questions from the recruiters. The more questions I asked to them, more was the fear vanished from my inside, and more impatient they would become. Still, the questions were answered with patience that could not be matched. As I observed this factor of humbleness in them, I realized how difficult it is to become an HR. Slowly and gradually when I started to get the knack of it, I enjoyed it even more. It became just like random talks to people regarding their employee sourcing patterns. There were people who did not want to answer, there were many who did not even pick up the phone, but the major chunk was the one who lived with the motto of ‘happy to help’. The days passed by and now naukri had become more like family to me wherein I spent more than 7 hours daily and never did I mind working even for longer hours. The staff was cooperative and was fun to be with. The last one week was tedious wherein all the data had to be compiled into one presentation which was to be presented to the Vice President and to other eminent people of the organisation. I started to compile the data and made the final college style presentation. I still remember my supervisor’s words- I would like to see your final persentation and in case of any corrections please show it to your colleagues and make the appropriate changes. The first question that came in my mind was what changes could be there in the presentation since its been done the same way. But the changes came in multiple figures. After showing it to so many colleagues, by their constant support the presentation turned out to be the best. It was so good that every time I looked at it, I found it to be one of my best works till then, and not only was it professional but beautiful too. Finally came the last day of the journey of my internship. It still makes me feel nostalgic. The last lunch that all three of us had at restaurant along with the Vice President and the supervisors was completely emotional. The place was to be missed and surely was the bay where I sat and not to forget the colleagues who are still ‘happy to help’. The internship made me learn many things about the corporate world, discipline, hard work, dedication, love, and not to forget, the targets. The corporate world’s insight was completely different from the college world. Want something similar for yourself? Check out the latest Internships in Delhi. Celebrated the birthdays of kids in Cancer hospital!